Nabendu Ghosh was undoubtedly one of the greatest scriptwriters in Indian Cinema. Through his long career, Ghosh penned about 60 scripts. The humane trait of his writing made him a natural choice for directors like Bimal Roy, Satyen Bose, Guru Dutt, Sushil Majumdar, Hrishikesh Mukherjee, Raj Khosla, Asit Sen, Basu Bhattacharya and Shakti Samanta. He later teamed up with newer directors such as Dulal Guha, Prakash Mehra, Sultan Ahmed, Mohan Saigal and Subhash Ghai. This offers a measure of the range and diversity of his screen writing. Gyan Mukherjee’s Shatranj (1956), Satyen Bose’s Jyot Jale (1968), Mohan Segal’s Raja Jani (1972), Arabinda Sen’s Jaalsaaz (1959) and Ajoy Kar’s Kaya Hiner Kahini (1973) (Bengali) were films based on his original stories. Nabendu Ghosh was born on March 27, 1917 in Dhaka that is now in Bangladesh, A writer of no mean merit, Ghosh shifted to writing as a fulltime occupation from his job in the secretariat of the DIG in Patna, His first novel, Bhagnastoop (The Ruins) was serialized in a Bengali magazine called Prabhati when he was still working. He had also begun acting on the amateur stage since he was a boy of 12 and continued with small cameos on screen and stage during his long years of stay in Mumbai. The seeds of a career in creative writing were also sown when he was in school. By 1940, he has established himself as a recognized writer of merit in Bengali literature. He got a Masters in English literature in 1939 from Patna then within Bihar Province. Some of his short stories and novels send shivers down one’s spine. 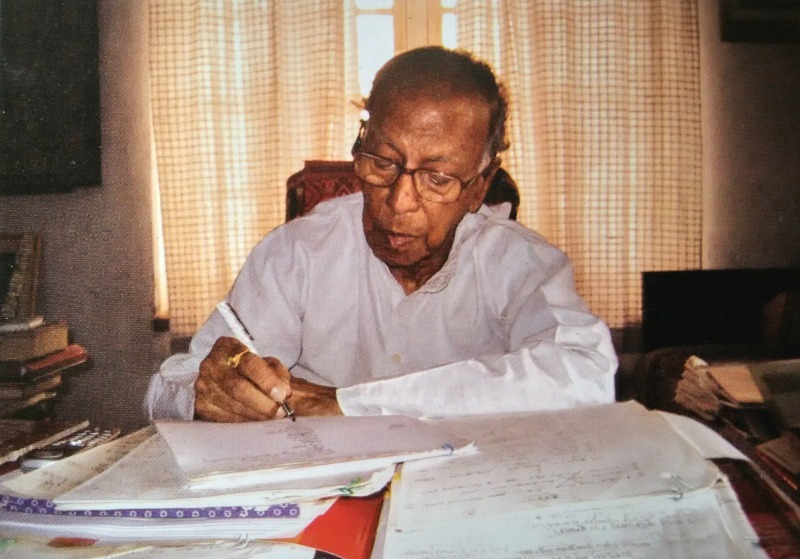 His involvement in the freedom struggle in the 1942 movement cost him his job at the DIG’s office in 1944 for his novel Dak Diye Jai, was set against the Quit India Movement. But the novel also made him famous and he shifted from Patna to Kolkata in 1945. He is among those frontrunners of the post-Kallol era of Bengali literature whose power over the pen was amazing. His subjects were rooted in realism, his language forever sought new expressions in aesthetics and focussed on the tragedy of human pain. His Ajab Nagarer Kahini, Phears Lane, Jeeboner Shaad, Bichitra Ek Prem Gatha are among memorable creations that will remain archived within the world of Bengali literature. Bichitra Ek Prem Gatha later became the base for Ghosh’s first completed and released directorial film, Trishagni. The story and the film juxtapose worldly desires with the exemplary discipline and distilled love between Pippali and Kapilani. “My reverence for Buddha has inspired me to write a Bengali novel derived from the story of Pippali and Kapilani in the Buddhist text Theri Gatha. Some other texts also mention how the newly married couple were drawn towards the Buddha and finally took refuge in him. Pippali later turned on to Maha Kashyap, one of the chief ‘lieutenants’ of Buddha. Bichitra Ek Prem Gatha marks 2550 years of Buddha,” wrote Ghosh for the Osian Cinefan Festival in June 2006, in Delhi, where the film was screened as a tribute to him. His oeuvre bears the distinct stamp of his outlook on life. He viewed literature as an instrument for tackling all that is sordid and destructive in life, society or state. His literary efforts are like fingers pointing at the sufferings of humanity not caused by men alone, but by the circumstances of history. His creative writing is characterized by a deep empathy for human emotions, mysterious layers of meaning that add to the depth of the spoken word, subtle symbolism, descriptions of unbearable life and yet not bound by worldly restrictions. Man, as portrayed by Ghosh, is at times empty and loathsome, and at other times supernatural. He has authored 26 novels and 14 collections of short stories. A notable theme of his comes out in Aami O Aami, a piece of science fiction that explores the experience of twin life in outer space. In his prize speech after receiving the Bankim Puraskar from Buddhadev Bhattacharya, Ghosh traced Bankim Chandra, the author of Vande Mataram, as his first inspiration. “I was so charmed by Durgesh Nandini that I stayed up nights creating a Nabab Nandini.” But his father advised him to learn from those he admired but to write from life around him and stopped him from becoming a copycat. Ghosh did just that and became the voice of the 1940s. He wrote not only on the Quit India Movement, about famine, about the pre-Partition riots and on post-Independence pressures, but as years went by, he broadened his canvas to write around the urbanization of India and against the backdrop of its nuclearization; about corruption of morals in political life and about the souring of love, fantasies of science and the weakening of faith. After Partition, when Bengali literature and cinema suffered a setback, Ghosh joined Bimal Roy as his screenplay writer when Roy decided to shift to Bombay in 1950. After Partition, when Urdu became the state language of East Pakistan in spite of the fact that 95% of the population spoke Bengali, films and books from West Bengal were banned in erstwhile East Bengal. This was a terrible setback for the Kolkata-based literary and film market. In a manner of speaking, it was this political division, which brought forth a division in terms of cinema and literature too, that prompted Ghosh to join Bimal Roy to shift to Bombay in 1950. Others in the team were Hrishikesh Mukherjee, Asit Sen, Paul Mahendra and Salil Chowdhury. Under Bimal Roy Productions, Ghosh wrote some of the best scripts ever in the history of Indian cinema. He began as assistant to Roy but got into script writing when Roy suggested he do scripts. His first screenplay was for Maa (1952), directed by Bimal Roy. But the credits did not mention him.He wrote the story and screenplay of Baap Beti, but still no name in the credits. His name began to appear in the credits for the screenplays of Parineeta (1953), Biraj Bahu (1954), Naukri (1954) and Amanat (1955), the last directed by Roy’s assistant Arabinda Sen. These films were a turning point for this great man who remained unassuming and modest till the end of his days, belying the history he carved for Indian cinema. He wrote the screenplays of Yahudi, Sujata, Devdas, Bandini and the documentary on Swami Vivekananda. When Roy gave him permission to work with other filmmakers, Ghosh wrote the screenplay for Guru Dutt’s Aar Paar and Hrishikesh Mukherjee’s Majhli Didi and Abhimaan. He wrote the script of Phani Majumdar’s Baadbaan, the first ever film in India to have been produced by a workers’ cooperative. Ghosh wrote the screenplay of Raj Khosla’s directorial debut film Milap, starring Geeta Bali and Dev Anand. Much later, Manoj Kumar’s early film as hero, Kaanch Ki Gudiya, had its screenplay penned by Ghosh. Though he penned the original story of Guru Dutt’s Kaagaz Ke Phool, the credits do not mention him. Right through his work as story and scriptwriter, Ghosh was preparing to take on the directorial wand. He had written a screenplay, tentatively titled Prem Ekti Kobita, in Bengali, based on Subodh Ghosh’s Ramgiri. Ashok Kumar stepped in to produce the film. The casting was complete with Ashok Kumar, Soumitra Chatterjee, Indrani Mukherjee, Tarun Bose and Padma Devi in the cast. “We shot for two days. But then, Ashok Kumar, angered with the production accounts, suddenly withdrew all support. Instead of being frustrated, I became more determined to go ahead with the project.”Ghosh once mentioned in passing. He then went on to write the script of Basu Bhattacharya’s Teesri Kasam (1966) based on a Phanishwar Nath Renu story. His next attempt at direction came with a film called Daktar Babu based on Phanishwar Nath Renu’s Maila Aanchal. The film shot several reels with an impressive cast of Dharmendra, Jaya Bhaduri, Asit Sen, Nasir Hussain, Kanhaiyalal, Kali Banerjee and Ajitesh Banerjee. But the producer died midway through the film and it never got made. He finally directed Trishagni (1988) based on a tale of triangular love and desire set against the backdrop of Buddhist history in the 1st century BC with Pallavi Joshi, Nitish Bharadwaj, Alok Nath and Nana Patekar sharing the acting credits. The film fetched Nabendu Ghosh his first and last National Award. He made another film for the Children’s Film Society of India called Netraheen Sakshi. It was about a visually challenged boy who could identify men from their voices. Ladkiyaan (1997), produced by the Ministry of Health and Social Welfare, was inspired by the true-life story of three sisters who committed suicide when they heard their father threatening their pregnant mother with dire consequences if she ‘dared’ to deliver a girl again. In 1995, he did a tele-serial called Anmol Ratan for Doordarshan on Ashok Kumar. Ghosh also took scripting workshops with the film direction students at FTII, Pune from 1967 to the early 1990s. He served on the script committee of the NFDC for some time and had served as member of several juries for the National Film Awards and the Indian Panorama. He headed the film delegation at the Festival of India in Thailand in 1997 with his film Trishagni. Nabendu Ghosh belonged to an age and generation where few film people talked about themselves or their work. The long string of awards that attached to his name over the years stood lightly on his petite shoulders. He has won almost every single literary award bestowed on Bengali litterateurs in the country from the Bankim Puraskar through the Bimal Mitra Puraskar to the Amrita Puraskar. He was lucid and filled with pleasant anecdotes from his life with Bimal Roy and other luminaries till the last day of his life. Alas! They don’t make them like him any more. A little-known fact about Nabendu Ghosh is that he was an acclaimed dancer who performed in Uday Shankar’s Oriental style, going on to win several medals between 1939 and 1945. He has acted in Lookochuri (Bengali, 1958), a comedy directed by Kamal Majumdar, Do Bigha Zamin (1953), Teesri Kasam, Majhli Didi (1967), Ek Aur Panchavati and Prahaar (1991). In Do Bigha Zamin, he did a bit cameo as a comic kulfiwalla while in Teesri Kasam he did the role of a rowdy village drunk. Nabendu Ghosh’s passing away on December 15, 2007 in Kolkata, marks the end of an era. Though no more, Ghosh has left behind an entire heritage of beautiful scripts that will remain in the archival history of Indian cinema for all time to come. Trishagni based on the story Maru o Swargo by Saradindu Bandopadhyay.